Sept. 23, 2013, 2 a.m.
Firstly what is FreeBSD diskless? FreeBSD diskless is an operating system that will boot on your computer (or virtual machine) over the network. There are many situations in which you probably want to use such a configuration. For example if you are a computer science teacher you could configure one system in your class and make other computers use it over the network. In another situation you could need some laboratory to play a little with the FreeBSD kernel.This configuration has a lot of benefits. For example you don't have to restart your developer machine every time you compile the kernel or worry that you broke your kernel and you will not have a developer machine any more. If you know me a little you probably know that I'm not a computer science teacher. I found a lot of interesting articles on this subject, but there was always one step that I would miss (or they). 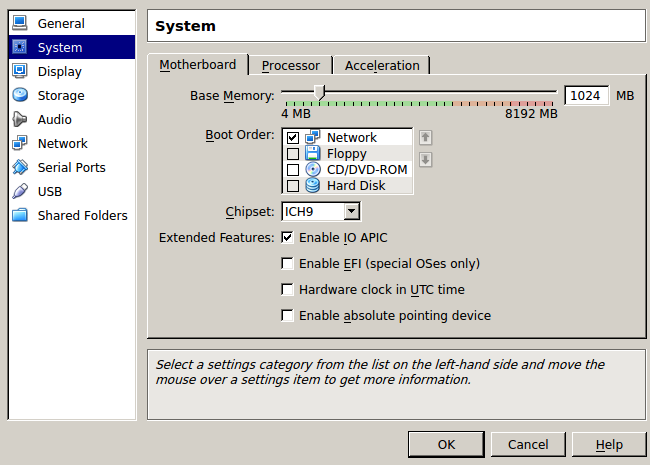 So I decided to write one final post about how to configure a FreeBSD diskless machine on VirtualBox. If you don't want to boot FreeBSD on VirtualBox but to create it just on a normal machine I recomended that you read this page from the handbook (http://www.freebsd.org/doc/handbook/network-diskless.html). I'm using the GNU/Linux operating system so my mentor and I (ya, I have a mentor, I am participate in GSoC (https://developers.google.com/open-source/soc/) and I'll probably write a few words about this later) decided to use VirtaulBox machines to create a developer environment for me. One virtual machine with FreeBSD and some cool stuff will by my developer machine and the second and third and fourth and x (give x the value you actually need in this moment) will run the operating system loaded from network with my custom kernel. So lets skip boring thing and let's assume that you have installed FreeBSD and some ports that you need. Firstly we need to get the FreeBSD kernel. What is cool about the FreeBSD kernel source code is that you can get it from many places (perforce, svn, etc...). For example, you can get the stable version of FreeBSD 9 from (svn://svn.freebsd.org/base/stable/9/) or just see what it looks likes on (http://svn.freebsd.org/base/stable/9/). Worth mentioning is the last option NO_CLEAN. It will prevent make from deleting yours compiled files so if you terminate compilation it will start in the place you left off. If you don't want to work on the kernel and just want to configure diskless you can download the FreeBSD livecd and unpack it. You don't have to do anything more with the kernel or world in this method. You have to create some virtual machine. In the default wizard just pick some name and choose type FreeBSD. After creating such a machine you go to the options to system tab. 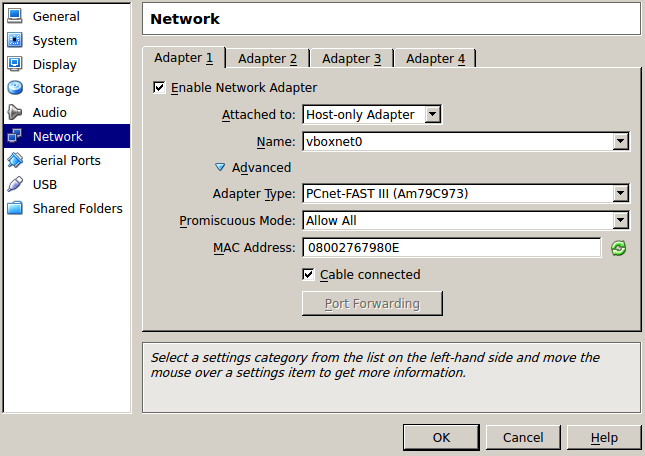 You leave only Network boot from boot order dialog. And write down somewhere your MAC address. The last and the most important step is to disable the VirtualBox DHCP server, to do it you go to File->Preferences->Network. 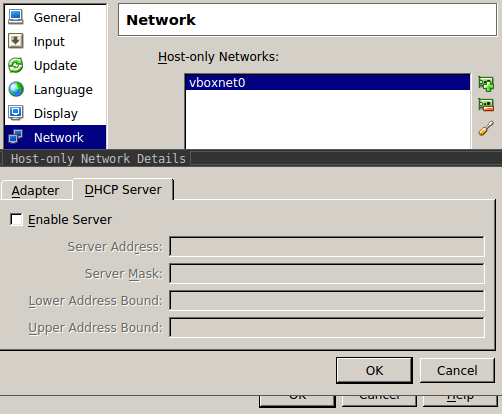 Select vboxnet0 and click screwdriver then you go to the DHCP Server tab and disable it. Or just restart your Computer (if you are using windows I am not sure if you must manually kill the DHCP server). If everything goes ok you should see very similar output. Which means that you want to export /root/directory and all directories in it (-alldirs option) to all machines which have an IP address looking like 192.168.56.x where x is a number between 1 and 255. -maproot=root options mean that you allow the root user to write data in exported directories. If you don't set this flag you will be not able to write in the root directory and you will probably have some trouble in using your diskless machine. If you are more interested in the available options for NFS you could find them in the manual (man 5 exports). $ echo nfs_server_enable="YES" >> /etc/rc.conf # This host is an NFS server (or NO). The last step in configuring NFS is to configure your root directory. We must set up a few files. Is worth checking if we have /root/directory/boot/loader.4th and /root/directory/boot/loader.rc. Sometimes those files are missing after doing installworld and installkernel. If you don't have those files simply copy them from the /boot/ directory. The last think that we need is the DHCP server. The DHCP server will tell what IP address this diskless machine should have (obviously) but also tell where our boot loader is (pxeboot) and what is the NFS root directory. There are several DHCP servers. I use isc-dhcp. You can find it in (/usr/ports/net/isc-dhcp42-server) I'm using version 42 but all later versions should work just as well. # You set the subnet and mask the same as in /etc/exports. If you got a message like this, this means you probably haven't disabled the VirtualBOX DHCP server properly. I am also obliged to thanks Unavowed for correcting a lot of my misspellings. Thank you!